Voici un lien vers la version francaise de cette page. Iseg NHQ/SHQ Control is a control software that allows to control iseg NHQ and SHQ high voltage power supplies. This software has been realized by Analog Flavor for iseg Spezialelektronik GmbH, Physical Instruments and their customers. We are also in charge of maintenance. The software allows to control a single power supply over it’s RS232 serial port. In general USB-RS232 adapters are used for this purpose. Of course Iseg NHQ/SHQ Control integrates our graph widget for graphical feedback. It uses the native Win32 interface on windows and Gtk on Linux. As a consequence the executable is lightweight and it runs on Windows XP, Mac OsX and most 32 and 64 bit Linux distributions. The software can be downloaded from the following links. Please get familiar with the software and read the iseg manuals before using the software on critical applications. The connection interface allows to scan all serial ports for SHQ and NHQ power supplies. The channel list that monitors the main values and parameters. The properties page allows to set the auto-start flag and to save values to the device’s EEPROM. The messages page logs all events are as text. Clicking on these messages generates annotations in the graphs. The file logger page. It allows to write the measured values to a CSV file at regular intervals. The configure page lets you configure some aspects of the user interface. The graph window shows either the measured voltages, currents or both. The software current trip allows to protect critical experiments if the hardware protection is not sufficient. Note that the Iset can be defined independently for the mA and the μA range. The applied value depends on the position of the mA/μA switch on the front panel. All new voltage settings must be confirmed by clicking the “Confirm Voltage Settings” button. This default behavior can be changed by setting the auto-start flag. The high voltage can only be switched on/off from the front panel. When editing a value in the channel list, the channel list itself is not updated immediately. Instead it sends a command to the power supply and shows the new value only once it has been confirmed. The software current trip only works while the software controls the high voltage power supply. 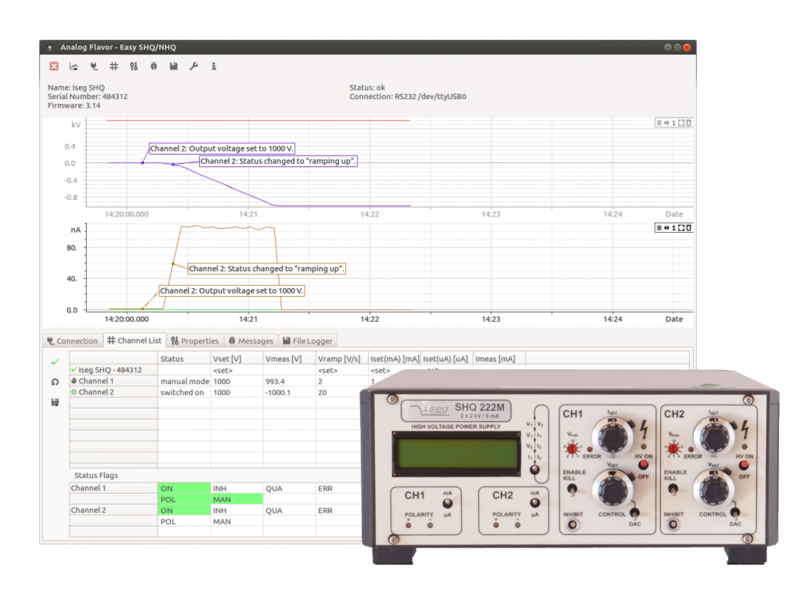 The software uses the current measured by the SHQ or NHQ modules to trigger a current trip. In the case of a current trip the concerned channel is ramped down. Please verify that the precision and the resolution of the current measurement matches your requirements before using this functionality. The “confirm dialog” is shown each time a value is written to the connected device. This dialog can be disabled form the “Configuration” page. The “Accept Changes” button must be clicked before changes in the configuration are applied. Don’t hesitate to contact our support for remarks or questions about the software. It will help us to improve Iseg NHQ/SHQ Control. Iseg NHQ/SHQ Control has been completed by our new control software Easy LV|HV.